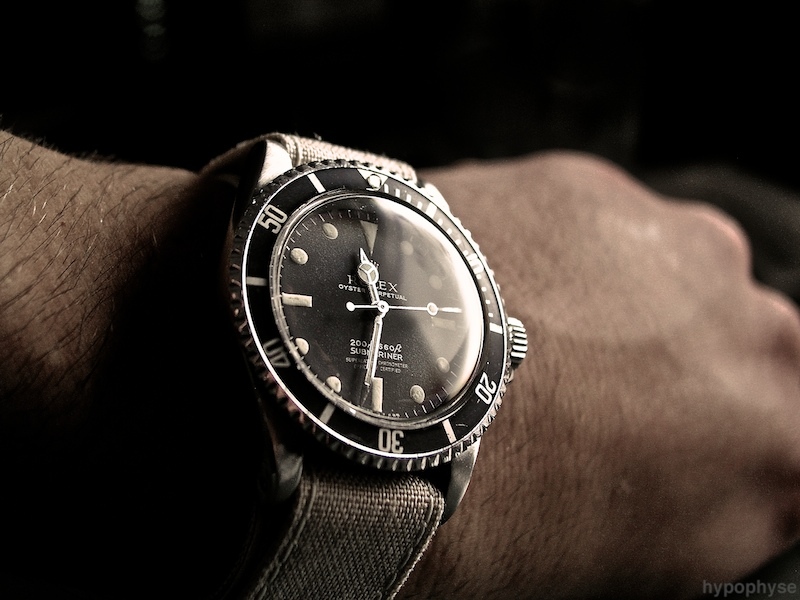 Below: the legendary Rolex Submariner – the most famous quality men’s watch of all time. 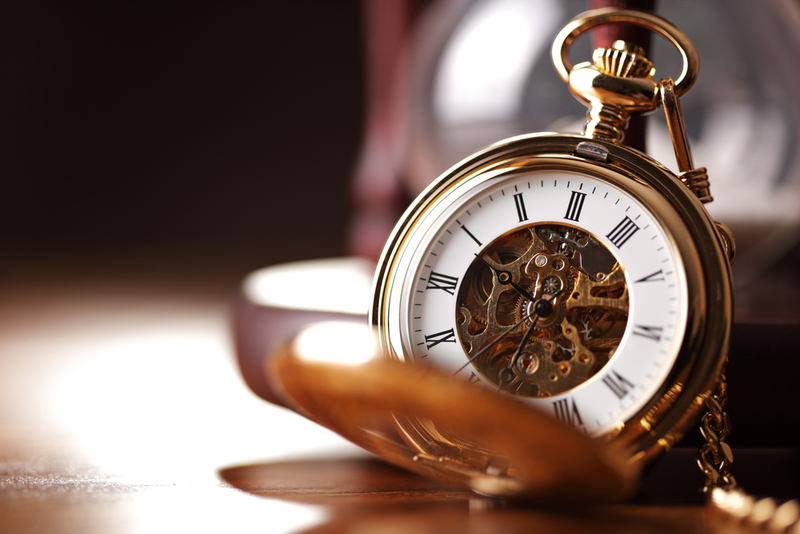 Are you looking for a true quality men’s wristwatch, which can endure the test of time, withstand almost anything, be worn for decades, and possibly be handed down to the next generation? If the answer is yes – you’ve absolutely come to the right place. Most likely, you’re looking for divers watches – primarily Swiss Made divers watches. Comfort (comfortable to wear and use on a daily basis). Accurate and reliable timekeeping. The movement could be quartz (battery driven), automatic or mechanical. Strong and robust movement with a strong build quality. 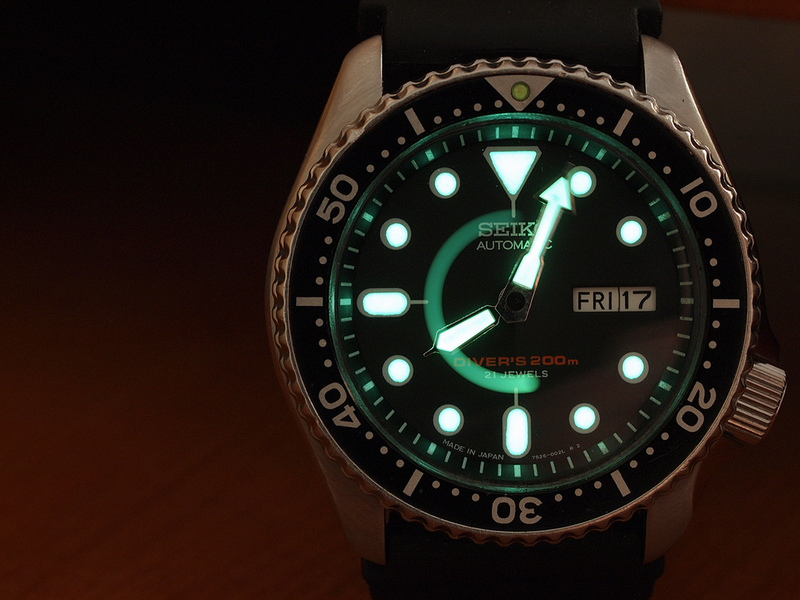 Easily readable dial with luminescent dial indicators. Solid and well built watches that are made to last. Carefree and easy to use. Water resistant down to a minimum of 200 meters – good for snorkeling and professional diving. Versatility – can be used for almost any occasion. With a few exceptions, almost all recommended watches below can be used everyday and for formal and festive occasions. A true quality watch doesn’t have to be super expensive, and only accessible to people with six or seven figure incomes. What’s truly important in a quality men’s watch, is what it can offer you for the amount you pay for it. Some of them are affordable and some of them are indeed expensive luxury watches made by premium brands. 16 of these watches are Swiss Made, 3 of them are Japanese, and 1 is Russian Made. Category of watches: Japanese sports – and tool watches. Casio G-Shock – the ultimate military tool watch? Casio is a Japanese wristwatch brand specialized in usable and versatile sports watches, tool watches and divers watches, with a multitude of features and functions. Casio G-Shock is the very epitome of what Casio as a brand represents. Tough, sturdy, extremely shock resistant, water resistant down to 200 meters/660 feet, equipped with an alarm function, has luminescent and readable dials, a chronograph and a strong outer exterior case. Casio G-Shock can withstand almost anything and will prove to be a reliable and loyal companion for any man or woman with an active lifestyle. The Casio G-Shock is a clear favorite in the US and Israeli defense forces. Category of watches: Japanese Made divers watches. Seiko is an expert on tool watches and divers watches, and the SKX series is no exception to this rule. The Seiko SKX family is a collection of highly affordable divers and tool watches with a robust build quality and a highly accurate movement. Water resistant down to 200 meters/660 feet, with an in-house made Seiko automatic movement, readable and luminescent dial, this is ideal for people who want a reliable and sturdy tool watch for daily wear. SKX007 and SKX009 use the identical in-house Seiko automatic movement, and they are both water resistant down to 200 meters/660 feet. The only difference is that the SKX007 has a black bezel while the SKX009 has a “pepsi” dial – a blue and red dial. None other than General H. Norman Schwarzkopf of the US Army wore a Seiko SKX009 in the first Gulf War in 1990, and if it’s good enough for General Schwarzkopf I guess it’s good enough for most military personnel. Category of watches: Japanese divers watches. The Seiko Sumo has got to be one of the very best all round watches of all time. Not only is it versatile and can potentially be used for the ordinary humdrum daily life, and festive and formal occasions, but this is most likely one of the very best divers watches and tool watches ever made. The movement is a highly accurate in-house made Japanese automatic movement. The glass is harldex which is a very tough crystal. The band and the bracelet of the Seiko Sumo feel more solid than the Seiko SKX. Water resistance is 200 meters/660 feet. The screw down crown, as you can see, is located at the 4 o’clock position which makes the setting of the date and the time slightly easier. All in all: one of the very best quality watches, tool watches and divers watches ever made. Highly recommended, and highly affordable! Category of watches: Russian Made military divers watches. I can only think of one true quality divers watch under $100, which is in fact very accurate, keeps excellent time, provides you with an automatic movement, is truly water resistant and is built like a tank, and that’s the Vostok Amphibian. Automatic watches are usually not sold under $100, but this Russian legend is. This is in fact a true classic and favorite amongst watch enthusiasts across the world. Granted it’s not Swiss, it’s not a luxury watch, and it’s not Rolex, Omega or Breitling, but it evokes nonetheless enthusiasm amongst watch aficionados all over the world. In 1967, the Soviet Russian leadership requested the designers at the Christopol watch factory to design and build a divers watch specifically made to meet the Soviet-Russian Navy’s technical standards and specifications. The divers watch had to be water resistant down to 200 meters/660 feet and had to withstand the changing pressure and temperature which is an inescapable fact as the diver descends deeper into larger depths. Switzerland obviously already had divers watches to meet these specific technical specifications, but since the Soviet Union wanted to manufacture their own divers watches, and since the Soviet Union lacked the equipment to provide the required and necessary accuracy, they could not copy or emulate the Swiss design. The task was given to Mikhail Novikov and Vera Belov to design a divers watch for the Soviet-Russian navy. They named it Vostok Amphibian because the name Amphibian would evoke a watch equally home on land and underwater. The Vostok Amphibian, internally and externally does not even resemble the classic or conventional Swiss design. It’s completely unique. The system of sealing the case and the internal movement against seawater, is vastly different from the Swiss technology, but has proven to be extremely effective nonetheless. 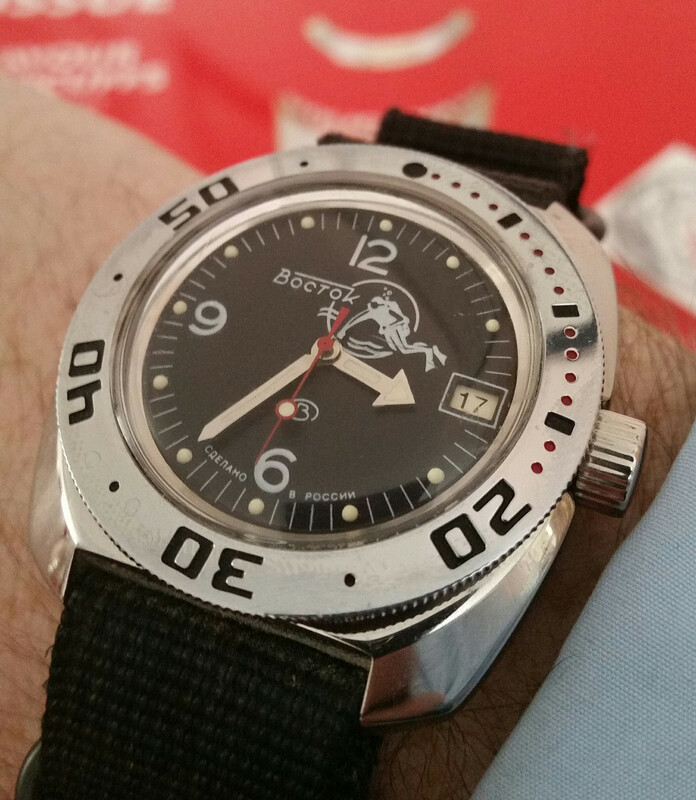 Vostok Amphibian keeps accurate time, is robust and built like a tank. It can withstand almost any punishment or brutal treatment. The movement is an in-house made Russian automatic movement with 31 ruby jewels and a minimum of 31 hours of power reserve. Personal recommendation: if you do decide to get a Vostok Amphibian on an ordinary metal bracelet (the ones in the upper shopping window), make sure you replace the rather cheap and flimsy standard bracelet (you might get disappointed with the standard bracelet) and replace it with say a shark mesh bracelet. You can purchase shark mesh bracelets at Amazon.com, or you can opt for the Vostok Amphibian which is already equipped with a shark mesh bracelet, in the lower shopping window. A small surprising element of the Vostok Amphibian: When you purchase the watch you’ll notice that once you pull out the crown, the winding crown is wobbly. Don’t worry. It isn’t broken or damaged. The winding crown is supposed to be wobbly. The winding crown of the Vostok Amphibian is designed to be detached from the internal winding mechanism inside the movement, so even if you accidentally knock the crown, it won’t damage the internal mechanism. Category of watches: Swiss Made divers watches. 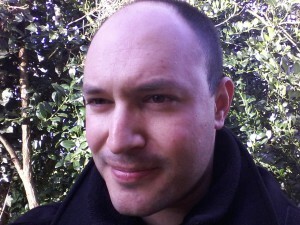 The video down below is the property of ablogtowatch.com, and the reviewer is none other than Ariel Adams himself. Victorinox was founded by Karl Elsener in 1884, in the city of Ibach, in the Canton of Schwyz, in Switzerland. The brand is an independent family owned company. Victorinox is first and foremost famous for its legendary Swiss Army Knife. The original commercial idea of Victorinox was to manufacture high quality pocket knives for the Swiss army. It wasn’t until 1989, that Victorinox launched its first watches. The Victorinox Swiss Army Dive Master has this unmistakable Victorinox design to it: an understated affordable high quality elegant versatile tool watch with a military feel to it. Victorinox Swiss Army Dive Master should interest all divers watch enthusiasts out there who want an affordable watch with a humongous depth rating. That’s exactly what Dive Master can offer you. Most of their watches cost below $2,000, and their depth rating is 500 meters/1,640 feet. This exceeds by far the depth rating of the legendary Rolex Submariner and the almost equally legendary Omega Seamaster Professional, where the water resistance is equivalent to 300 meters/1,000 feet. Not only does the Victorinox Swiss Army Dive Master cost a fraction of the Rolex Submariner and the Omega Seamaster Professional – the Dive Master offers you a 66% higher water resistance than the Rolex Submariner, and the Omega Seamaster Professional. The Victorinox Dive Master truly is a bang for your buck. With this collection, Victorinox does offer you tremendous value for money. Either equipped with Swiss quartz (battery) movements or the more upscale automatic Swiss ETA 2892.A2, these watches keep very accurate time. The material of the case is stainless steel, black painted stainless steel or gold painted stainless steel, and these watches either come in rubber straps or metal bracelets. Tissot is one of the most affordable and famous Swiss luxury watch brands on the market, and Tissot is within the financial reach of most people, and it’s a very successful brand. Tissot offers their watches at retailers in more than 160 countries. This is a serious divers watch both for professional and amateur divers. Tissot Seastar is a very affordable Swiss Made divers watch with a depth rating of 300 meters/1,000 feet, which is equivalent to the depth rating of Rolex Submariner, and Omega Seamaster Professional. The Tissot Seastars come primarily in three diameter sizes: 42mm, 45mm, and 48mm. Their largest watches are similar in size to what Breitling has to offer you. The movements utilized in the Tissot Seastar are naturally Swiss. The movements are either Swiss quartz (battery) chronograph movement, G10.211, Swiss automatic movement, Caliber Powermatic 80, and Swiss automatic chronograph movement, Caliber C01.211. The Caliber C01.211 is not the ETA/Valjoux 7750 movement, but rather a lower cost version of it. Caliber CO1.211. is based on Lemania 5100. Water resistance is 300 meters/1,000 feet, which means Tissot Seastar is on par with the Rolex Submariner and the Omega Seamaster Professional, but only at a fraction of the cost. The case is made of high quality stainless steel. Alpina is truly a brand that I wish more people have heard about. Definitely an underestimated brand which is consistently ignored. It truly is an anonymous and “under the radar” quality Swiss wristwatch brand. The Alpina Seastrong Collection consists of divers watches and sailing watches. These are typical sporty looking tool watches with a robust feel to them and a technical and professional look to them. Even though Alpina may not be a very famous brand, it offers you very good watches considering the money you spend on them As far as movements and price range are concerned, Alpina probably belongs in the same category of watch brands and manufacturers such as TAG Heuer, Longines and Oris. Alpina’s divers watches are somewhat similar in design to the Omega Seamaster Collection. The movements utilized are AL-240 quartz movement, AL-525 automatic movement (base movement is Swiss ETA 2824-2 automatic), AL-725 automatic movement (base movement is Swiss ETA/Valjoux 7750 movement), and the AL-880 automatic movement (base movement Sellita 500). The watches displayed above, have a water resistance of 300 meters/1000 feet, even though the more extreme models (not featured here) can offer you as much as 1000 meters/3300 feet. The case material is high quality stainless steel. In similarity to Alpina, Certina isn’t a well known brand although it’s in all fairness slightly more known than Alpina. Certina was born in 1888 and was established by two brothers, Adolf Kurth and Alfred Kurth, who set up their own manufacturing facility in the Swiss town of Grenchen. Certina is a sporty brand for people with an active lifestyle who need an affordable, reliable, accurate, well built sports watch with can endure the test of life. The Certina DS Action Diver is the divers watch collection of this brand which is visually speaking quite similar to the Rolex Submariner: large dial indices, a small crown protector, an easily manageable unidirectional bezel, and a tapered bracelet. The Certina DS Action diver either comes in 316L Stainless steel or titanium, and either offers you Swiss quartz movements, or automatic movements. The automatic movements are either ETA 2824-2 (without chronograph) or ETA Valjoux 7753 (with chronograph). The water resistance of some models is 200 meters/660 feet, or 300 meters/984 feet. What’s interesting about their automatic versions is that they are ISO certified. “ISO” stands for “International Organization for Standardization“. The standards for what exactly constitutes a divers watch is regulated and defined by ISO-6425 – this is the international standard for divers watches. Only watches that are officially, formally and technically ISO-6425 certified, are considered to be full-fledged divers watches. So if you’re looking for a seriously affordable high quality sports- and divers watch, I can highly recommend the Certina DS Action Diver. You do get a lot considering what you’re paying for it. Maurice Lacroix was founded in 1975, with headquarters in Zurich in Switzerland. Maurice Lacroix is a subsidiary of Desco von Schulthess, and this company has roots in the silk trade and was founded in 1889. Maurice Lacroix in similarity to most Swiss quality and luxury wristwatch brands, isn’t independent but is a subsidiary of corporate group. Maurice Lacroix’s philosophy is to develop, design and manufacture watches with unique and powerful designs coupled with a workmanship of Swiss quality and standard. The Maurice Lacroix Pontos Diver is a good reliable tool watch and divers watch. It has got an inner bezel which is operated from the outside with a crown/button, and the watch has a water resistance of 600 meters/1,970 feet. A few of their timepieces have a water resistance of only 200 meters/660 feet. Usually you have to pay a lot more to get a watch with such a water resistance performance (Rolex, Omega, Breitling, IWC, Jaeger LeCoultre etc) but the Maurice Lacroix Pontos Diver truly is a bang for your buck. The water resistance of the Maurice Lacroix Pontos Diver outperforms most watches by TAG Heuer, and Longines. An interesting feature of Maurice Lacroix’s divers watch is the Rolex-style automatic helium valve, (located at the side of the case) used for deep sea diving. Maurice Lacroix Pontos S Diver employs Swiss automatic movements such as Maurice Lacroix automatic movement ML 115 (base movement Swiss automatic Sellita SW200), and Maurice Lacroix automatic movement ML 112 (base movement Swiss automatic ETA/Valjoux 7750) which is used for chronographs. Their quality divers watches either come in stainless steel or PVD sandblasted stainless steel, and the straps are either made of leather or textile, and their bracelets come in stainless steel. One of the very best relatively affordable quality men’s watches, that are made from 316L stainless steel, just like Omega and Breitling, offer a water resistance of either 300 meters/1,000 feet, which is on par with the Rolex Submariner and the Omega Seamaster Professional, or 500 meters/1,640 feet, which exceeds the water resistance of both the Submariner and the Seamaster. The movements utilized by TAG Heuer are either Swiss quartz movements, or Swiss in-house made movements, or Swiss ETA and Valjoux movements, which are made by Swatch Group. The TAG Heuer Aquaracer is a very robust and well built watch with reliable and accurate movements. The bezel has a solid feel to it, and the metal bracelet tapers nicely for extra comfort. Besides metal bracelets, you’ll find the Aquaracer in rubber straps as well. There is also a “fame factor” to the Aquaracer. Celebrities known to wear TAG Heuer are Brad Pitt, Matt Damon, Cameron Diaz, and professional golf player Tiger Woods. The Longines HydroConquest exudes class and timeless elegance and the watch has a robust and rugged feel to it, and is a good quality watch to start with if you wish to purchase you very first luxury wristwatch. The Longines HydroConquest is an obvious contender to the TAG Heuer Aquaracer, is definitely an affordable alternative to the Rolex Submariner, and is one of the best quality watches that money can buy in the $700 – $2,000 price range. Longines’ divers watches are relatively affordable in comparison to higher end brands on the luxury and quality wristwatch market today, and offer you a 300 meter/1,000 feet water resistance which is fully comparable to many high end Swiss brands out there. To give you a comparison here: TAG Heuer Aquaracer (depends on the specific Aquaracer model), Rolex Submariner, and Omega Seamaster Professional too have a depth rating of 300 meters/1,000 feet. You’re only paying a fraction of what a Rolex Submariner or an Omega Seamaster Professional would cost you, and you get the same water resistance in a Longines HydroConquest. Longines is owned by Swatch Group and relies on generic, standard but reliable and accurate Swiss movements – either quartz or automatic ETA movements. For the automatic movements, the Longines HydroConquest relies on Longines automatic ETA base movements ETA 2892-A2 and ETA 2824-2. For the automatic chronographs, the same collection relies on Valjoux movements. In 1904, Paul Cattin and Georges Christian, established Oris close to Hölstein in Basel-Country in Switzerland. The headquarters of Oris are still in the small Swiss city of Hölstein. Oris is one of very few independent Swiss watchmakers left. Oris is famous for making relatively affordable mechanical watches. According to Oris, they have never made battery/quartz driven watches and they never will. An affordable serious down to earth tool watch and divers watch, made of top notch quality materials such as 316L stainless steel and/or titanium. Some of their models offer you a water resistance of 30 bar/300 meters/1,000 feet or 50 bar/500 meters/1,640 feet, which means Oris Aquis’ water resistance is absolutely on par with the venerable Rolex Submariner and the Omega Seamaster Professional. The Oris Aquis is a sturdy and robust tool watch, meant primarily for daily wear but you could pull it off wearing it during more formal and festive occasions. All Oris’ watches rely 100% on automatic mechanical movements so you won’t find any quartz movements in an Oris Aquis. The automatic movements are either ETA/Valjoux movements made by Swatch Group, or Sellita movements made by Sellita. A really neat function in some of the Oris Aquis divers watches, is a mechanical depth gauge, which you will rarely find in any watch at any price point. All in all, the Oris Aquis is truly a bang for your back. It’s an affordable quality watch with top notch quality materials, an automatic movement (which is relevant to watch enthusiasts), a sturdy construction and a truly respectable water resistance. If you want an alternative to the considerably more famous Swiss brands such as Rolex, Omega, Breitling, TAG Heuer and Longines, Oris is the right choice. Oris isn’t trying to imitate anyone or any brand. Oris is Oris. Oris ProDiver is essentially Oris Aquis on steroids. These watches are massive with a 50mm plus diameter. These are truly professional divers watches and tool watches, and they are ideally used for daily wear, and not for formal or festive occasions. These watches are made from high quality titanium, all their movements are automatic mechanical, their movements are either ETA movements made by Swatch Group or Sellita movements made by Sellita, and their water resistance is 100 bar/1,000 meters/3,280 feet. The water resistance is massive and outperforms almost all competition on the market today. In similarity to Oris Aquis, some of the Oris ProDivers offer a mechanical depth gauge which you will rarely find in any watch at any price point. Definitely more pricy than Oris Aquis, but the water resistance is considerably more pronounced, and these watches truly are massive! Tudor is a subsidiary of Rolex and was established by Rolex’s founder Hans Wilsdorf in 1946, in order to offer customers a more affordable alternative, that would deliver the same reliability and quality as the parent company. Rolex manufactures the Tudor watches at the Rolex facilities in Geneva, Switzerland. Tudor is known to make very good and affordable divers, and sports watches, and it’s precisely sports, and diving that define Tudor as a brand. Tudor’s brand identity is of course also based on being a subsidiary of Rolex which can offer more affordable watches than the parent company. In the past, Tudor watches relied almost exclusively on generic ETA movements such as ETA 2892, and ETA 2824, but nowadays, Tudor’s movements are in-house made by Rolex and COSC certified. It appears that even though Rolex originally meant for Tudor to be a more affordable alternative to the parent company, by cutting expenses and relying on a third party – usually Swatch Group, to make Tudor’s movements, the current trend shows that Tudor watches are climbing up the hierarchy of the world of luxury watches. Maybe you wonder why Tudor Heritage has a “vintage look”. Its vintage look is a homage to the original Rolex Submariners of the 1950s. Just like the original Rolex Submariners of the 1950s and the 1960s, many watches within the Tudor Heritage collection don’t have a date function. Opting for Tudor means you are opting for a watch which belongs to a respected, and admired Swiss luxury brand, and opting specifically for Tudor Heritage means you’ll get a watch with a classic and timeless design. Buying a Tudor means that you’ll get a taste of the Rolex brand, but in a considerably more reasonable price range. If you’ve always wanted a brand-new, fresh from the factory divers watch with a vintage look, Tudor Heritage might just be the watch you are looking for. Tudor is a versatile reliable divers watch, tool watch and sports watch, just like the Rolex Submariner. It can both be used for daily wear and formal and festive occasions. Unlike the Rolex Submariner, the Tudor Heritage uses the 316L stainless steel instead of Rolex’s marginally better 904L stainless steel, which reduces the cost of making a Tudor. Tudor’s automatic movements are known across the globe of being highly accurate and reliable. Tudor Heritage’s movements are either Swatch Group’s ETA 2892 and ETA 2824, or Tudor’s (Rolex’s) chronometer certified in-house movements MT5601, and MT5602. Tudor offers you a water resistance of 200 meters/660 feet, and the collection offers you either quality leather straps or metal bracelets with a robust and almost indestructible feel to them, built in the true Rolex spirit. Breitling Avenger II Seawolf – Breitling’s most extreme divers watch. So, you thought that the Oris ProDiver with its 1000 meters/3,280 feet would have the last word on water resistance? Think again, because the Breitling Avenger II Seawolf has three times the water resistance of the Oris ProDiver. The Avenger II Seawolf is Breitling’s heaviest artillery as far as water resistance is concerned. With a water resistance of 300 bar/3,000 meters/9,843 feet, it’s difficult to beat this water resistance performance of Breitling Avenger II Seawolf. The Seawolf outperforms nearly all competition in water resistance, toughness and robustness. As far as water resistance is concerned, very few quality brands can match Breitling. The other brands would be Rolex, Omega, Bell & Ross and Oris. Made of 316L stainless steel, equipped with a chronometer certified automatic movement (meaning a highly accurate and reliable movement) – the Breitling automatic Caliber 17 (base movement Swiss automatic ETA 2824-2) and a robust case and bracelet, make this timepiece most definitely a tool watch which you can depend on. It’s a versatile timepiece, ideal for daily wear but I think you could pull it off wearing it at more formal and festive occasions as well. There are indeed other versions of the Chronomat, such as the Chronomat 38 (38 mm diameter) and Chronomat 47 (47 mm diameter), but we will narrow it down to the Chronomat 41 & Chronomat 44, since they are the most common diameter sizes within the Chronomat collection. Both the Breitling Chronomat 41 & Breitling Chronomat 44 contain Breitling’s exquisite and highly accurate, highly reliable, in-house made automatic Breitling chronometer certified chronograph movement B01 – one of the very best automatic chronograph movements in the industry. Breitling is an expert on chronographs and chronometers, and besides the Navitimer collection, the Chronomat 41 & 44 are the flagship collections of Breitling. Both collections – the Chronomat 41 and Chronomat 44, are made from 316L stainless steel (high grade steel), and offer you combined steel and gold versions as well, and both collections offer you chronographs only, both collections are chronometer certified, and both collections’ movements are in-house made by Breitling, and both collections offer you massive power reserves of 70 hours, 47 jewels and a movement frequency of 28,800 vph (28,800 vibrations per hour). So what’s the difference between Chronomat 41 & Chronomat 44? Breitling Chronomat 41 has a 41mm case diameter, relies exclusively on the B01 in-house made Breitling chronograph movement, and offers you a water resistance of 300 meters/1000 feet. Breitling Chronomat 44 has a 44mm case diameter, offers you both the B01 in-house made Breitling chronograph movement, and the GMT version (2nd time zone function) – the B04 in-house made Breitling chronograph & GMT movement, which uses the B01 as its base movement. The water resistance here ranges from 200 meters/660 feet to 500 meters/1,650 feet. So what’s so special about the Chronomat 41 & Chronomat 44? In addition to relying exclusively on Breitling’s in-house made chronometer certified automatic chronograph movements B01 and B04 – amongst the most accurate and reliable Swiss automatic movements in existence today, the Chronomat 41 & 44 are combined divers watches and pilot watches. Chronomat 41 and Chronomat 44 are truly the masters of the heavens and the masters of the sea – and masters of accurate timekeeping. Omega Seamaster Professional is the classic Seamaster which was and still is Omega’s very first divers watch. Omega Seamaster Professional dates back to the 1950s. It’s the oldest of all the Seamaster collections. Even though the Omega Seamaster Professional has undergone several aesthetic changes since the 1950s, the Seamaster Professional Collection can trace its origins back to the 1950s. The Omega Seamaster made its debut in 1948 as a water resistant sports and dress watch, but it wasn’t until 1957, that Omega Seamaster became known to the world as Omega’s legendary divers watch. Ever since 1957, the Omega Seamaster has been the official competitor of Rolex’s champion – the Rolex Submariner. It’s specifically the Omega Seamaster Professional that has been the Nr 1 adversary, nemesis and competitor of the Rolex Submariner. Ever since 1957, Omega and Rolex have competed over who has got the best divers watch. Omega Seamaster Professional is known across the world for its exceptionally reliable and accurate movements, and unusually beautiful, and comfortable watch cases and bracelets. The Omega Seamaster Professional is consistently regarded as one of the most comfortable, aesthetically appealing, beautiful, sturdy, well built, and accurate luxury watches, that have ever been produced by a luxury watch manufacturer! The Sea Horse Logo on the case back of the Seamaster Professional is somewhat of a legend. The Omega Seamaster Professional is consistently considered by many watch enthusiasts across the world, to belong among the 10 or 20 most legendary timepieces ever made by man! The chronometer certified Co-Axial 2500 movement, which is still being used by Omega Seamaster Professional, is consistently being ranked among the top 10 most accurate automatic/mechanical movements ever made. Made from 316L stainless steel, and equipped with a beautiful and robust bracelet, the Omega Seamaster Professional is an ideal all-round watch which can be used for daily wear and for life’s special moments. The pre-ceramic Omega Seamaster Professional (those with metal bezels) have been used by Bond since 1995. The ceramic ones (those with ceramic bezels) haven’t been used at all in the Bond films. Omega currently manufactures Omega Seamaster Professionals with the ceramic bezel. This is the closest you can get today, to the classic Omega James Bond watch. I still think you can manage to find and purchase the classic Pre-Ceramic Omega Seamaster Professional James Bond watches online. Ebay.com is the best place to find them. However, if we need to compare the old “James Bond Omega Seamaster Professionals” of the 1990s and the early 2000s, to the modern renditions of them, the modern ones will most definitely trump the old. The modern Seamasters have more solidly built bracelets using screws instead of pins. The bezel is ceramic on the modern rendition of the Seamaster Professional 300M, and the dial indices are larger and easier to read. The modern Omega Seamaster Professionals above have several aesthetic, functional and technical upgrades that make them considerably better quality products than the old ones. In similarity to Rolex’s in-house movements, Omega’s 8500 caliber, and several variations of it, is chronometer certified, extremely accurate and reliable and anti-magnetic. You can basically divide the Swiss watchmaking industry into two camps: Rolex, and the rest. That’s how excellent, prestigious, famous, and dominant the Rolex brand really is. Established by Hans Wilsdorf in 1905, Rolex is by far the most iconic and legendary luxury watchmaker in the industry. Its fame is mythical and unmatched, and rightly so: Rolex makes among the very best automatic/mechanical watches in the industry with extremely accurate, reliable, durable, shock resistant, anti-magnetic and robust movements, the best steel grade in the industry (904L stainless steel), unmatched build quality, unmatched reputation, and unmatched resale value. All Rolex’s movements are in-house made by Rolex, all movements are chronometer certified and all Rolex’s movements use the so called parachrom hairspring. This technology is very particular and unusual because it is 100% anti-magnetic and 10 times more shock resistant than ordinary hairsprings! This makes all the difference because the hairspring sits inside the balance wheel, which is the very heart of an automatic/mechanical movement. All Rolex’s movements must fulfill the criteria set by COSC. Rolex’s accuracy rate is equivalent to 99.998%. Rolex is a super conservative and super reliable brand. If you purchase a Rolex, you know what you’ll get. Rolex Submariner is also known for having been the original wristwatch worn by the cinematic James Bond. The Submariner has been worn by several Bond actors such as Sean Connery, George Lazenby, Roger Moore and Timothy Dalton. The old vintage Rolex Submariners of the 1960s, 1970s and 1980s (those were worn in the Bond movies of the good old days) aren’t produced today, but you might still be able to purchase them at ebay.com. The particular model Sean Connery was wearing in the 1960s, was a Rolex Submariner Model Nr. 6538. The Rolex Sea Dweller is the ultimate divers watch made by Rolex, and is essentially the Rolex Submariner on steroids. Just like the Rolex Submariner, the Rolex Sea Dwellers use the chronometer certified Rolex in-house made automatic movement 3135, Rolex’s high grade 904L stainless steel, and the glidelock system with which you can adjust the bracelet on the fly without having to use any tools for that purpose. The difference between the Rolex Sea Dweller and the Submariner is water resistance, and some minor aesthetical differences: the Rolex Sea Dweller has an automatic helium escape valve at the side of the case at the 9 o’clock position, and a thicker and larger case. In 1967, Rolex launched the famous Rolex Oyster Perpetual Sea-Dweller which is the ultimate divers watch collection invented and manufactured by Rolex. The original Rolex Sea-Dweller was water resistant down to 610 meters. Today, there are two versions of the Sea-Dweller. 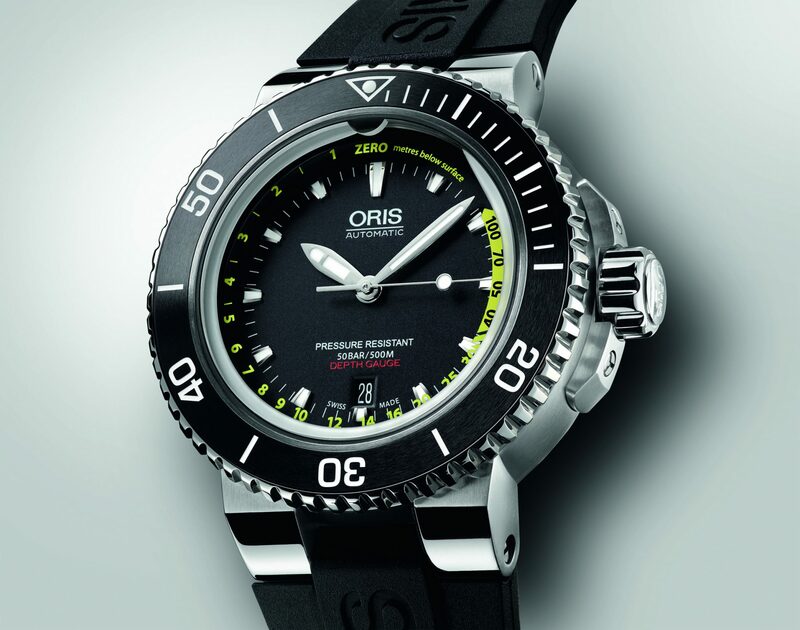 The larger version is water resistant down to 3,900 meters/12,800 feet, which by far exceeds that of the Oris ProDiver and the Breitling Avenger II Seawolf . The Rolex Sea Dweller Deepsea is also equipped with an automatic helium escape valve at the 9 o’clock position and in similarity to its “smaller brother” – the Sea Dweller 4000, has no magnifying lens covering the date window. In 1978, Rolex launched the Rolex Sea-Dweller 4000. “4000” refers to its depth rating – 4,000 feet. This is the smaller version within the iconic Sea Dweller Collection. Opting for a Rolex Sea Dweller means you are getting one of the world’s very best divers watches that money can buy. If you have any questions, comments or suggestions, please post them down below and I’ll be happy to answer them!